Anonymous sent me a comment with a link to this story at the Discovery News. 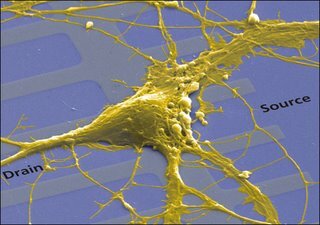 "April 19, 2006— A rat nerve cell attached to a semiconductor chip has exchanged a signal with the chip, an achievement that could lead to organic computers that process information like a brain, say researchers." If you want to see the meaning of this innovation you should read Kevin Kelly's WE ARE THE WEB article about "The Machine" - the machine within which we already live. It is a long article, so if you are busy scroll down until the sub-paragraph 2015. That vision combined with the facts told by The Brain in The Vat-team at UCSD Neuro-science here is clearly worth of a longer story. I'll try to write that before tomorrow. Stay tuned! What an incredible piece! Thanks for posting this kind of news, good blog.